Change your home or “Grow” a new one? Or maybe another solution we can consider is to “grow” our own home? 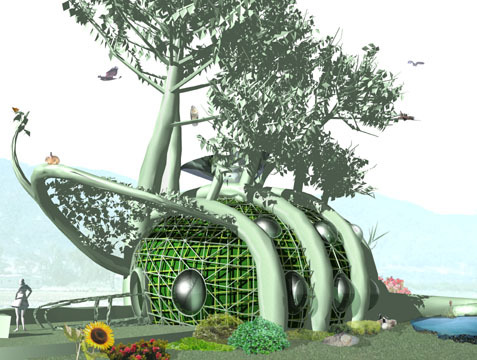 Architect Mitchell Joachim‘s Fab Tree Hab is a living structure that “is designed to be nearly entirely edible so as to provide food to some organism at each stage of its life. While inhabited, the home’s gardens and exterior walls produce food for people and animals. The seasonal cycles help the tree structure provide for itself through composting of fallen leaves in autumn. The envisioned bioplastic windows, which would flex with the home as it grows, would also degrade and return to the earth upon life’s end, as would the walls.” This means we don’t even have to use the terms biodegradable to describe the home since none of the materials is processed. Here’s a link of a video showing how the interior will look like.